Our goal is to supply the finest and most unique products gathered and grown from the north country. We offer dried floral arrangements, wild American ginseng collected from the state of Vermont, and our own Wild-Simulated ginseng grown here in Maine. We also grow a variety of other herbs and spices. Pictures of our own 65-year-old root weighing 128 grams, 30-year-old root, etc. 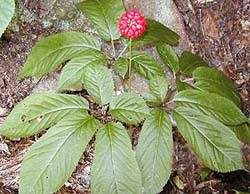 A series of pictures that show the yearly cycle of ginseng growth, from breaking though the ground to the leves falling off the plant. Images of our original arrangements and creations. It doesn't get any more creative than this! You have visted this page times.